Lately I’ve been having many conversations about boredom with clients and friends. I’ve been feeling a tad restless myself and not sure where its coming from. Below is an article I found on boredom — its an interesting look at where boredom comes from and its complex nature. Reading the article I noticed feeling engaged and not bored. There are so many things to do on this planet … things to see, hear, taste smell and touch. So many things to challenge our minds. Today, challenge yourself to do something different- something you have not tried - challenge yourself to be truly curious about something - anything. Then just notice what happens … what happens to boredom when you are feeling challenged? What is Boredom and Where Does It Come From? You take it for granted and the internet capitalizes on it, but it's a unique psychological phenomenon. Boredom ranges from a mild, hazy inability to pay attention, to an unholy feeling that even pain might be a sweet relief from nothingness. It is the itch we spend our lives scratching, and it is a considerably more complex phenomenon than most people think. It’s a curse of evolution, sure, but also a weird sort of blessing. 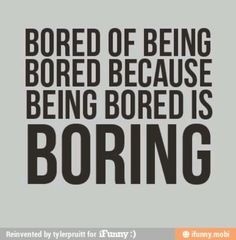 1) Boredom requires having a certain amount of energy, and no sense of where to devote it. You can’t simply be in the midst of something that’s not fun or stimulating in an emotional, mental, or physical sense. You have to feel like there’s nothing particularly engaging going on, and a sense of wastefulness adds to the pressure to do something. 2) Being bored is about being aware of your own boredom. When you’re bored, your mind’s typical reaction is to let itself wander off into loose threads hanging around and daydream. In a 2012 paper published in Perspectives on Psychological Science a group of researchers found that this actually just accentuates the feeling of boredom — presumably because the moment you become aware you’re daydreaming emphasizes how boring your current situation is. 3) The feeling of boredom comes from a perception that it’s an environmental factor. Boredom isn’t a choice you make for yourself; therefore, you’re likely to believe it’s the outside world that’s failing to hold your attention. Nothing around you is happening — at least, nothing interesting. How true that is entirely dependent on the kind of person you are and what’s actually going on, since there might actually be a thousand different things worthy of your attention. All of this culminates in a feeling of powerlessness — which is the most problematic consequence of boredom. When you feel like you have little control over your situation, you’re effectively handing off agency over your own feelings. A mild irritation cascades into a feeling of being trapped. Time slows down. You start to dislike the things you think are making you bored and you dread having to be confronted with them again— such as your boss leading a meeting at work, a terrible book you picked up, or Vince Vaughn in the second season of True Detective. Calibrating: feeling slightly unpleasant. Open to anything that might cure the bored feelings, but not yet in a state of exploration. Searching: an increased sense of negative feelings, where the individual is actively looking for something to do. Reactant: an intense feeling of negativity, where the bored individual starts indicting other people, places, or things for their own boredom. Their sour about their situation, and ready to blame anything else for it. Apathetic: someone in this situation is actually experiencing low arousal. They don’t skew positive or negative — they are more in the midst of feeling a certain sense of helplessness or depression. In the context of these categories, the boredom you’re likely to feel may also depend largely on the type of personality and disposition you have. If you’re easy-going, you probably seldom feel reactive, and are more likely to just be indifferent. If you’re naturally aggressive, your boredom is probably reactive (and your friends are likely the same). The question remains: Why do we even get bored? Scientists have yet to really determine that. One can probably imagine that as our brains got better and our cognition became much more complex and we learned how to process all the things our senses were picking up, boredom became a way to identify the lack of that sensory measurement. Ennui was our physiological reaction to surroundings and situations with which there was no longer a reason to be engaged in. And for our ancestors, this was the perfect fire under our asses to keep moving. Stimulation keeps our brains active and less prone to atrophy and degradation. Modern-day technology has greatly transformed what boredom means. With devices at our fingertips, we always have something to do to stave off severe boredom, which means we often experience the feeling as a sort of mist or haze. Severe boredom is almost extinct, which is both good and bad. It’s good in the sense that information is fun, but bad in the sense that boredom offers the raw materials for creativity and relaxation. If boredom is a self-imposed state than it can also be banished by the very minds that suffer from it.